Susanne Lamb explores Sam's Point in Cragsmoor, New York, a part of Minnewaska State Park Preserve where visitors can find a waterfall, ice caves and beautiful vistas. Last summer, Earthjustice partnered with the Creative Action Network (CAN) to launch “Join the Pack,” an art campaign that combats age-old stereotypes about the gray wolf and celebrates the species as an icon of the wild. Artists heeded the call to create a body of work that brings attention to the plight of the gray wolf. In this blog series, we interview the artists behind the beautiful art submissions to learn what inspired them to imagine a kinder, gentler Big Bad Wolf. The following is an interview with artist Susanne Lamb. RO: How did you get your start as an artist? SL: Drawing is something I could never stop doing once I started. Becoming an artist always was the plan. Really establishing myself as artist is an ongoing process! RO: What inspires you about wolves? SL: Wildlife is endlessly inspiring, and wolves so wholly capture the spirit of the wild. It really doesn't get much more primal! I love the idea that wolves have such a valuable place in the ecosystem; while they feel so predatory, they are effectively providers for many scavenging animals as well. "That's Amore" by Susanne Lamb is a piece of original artwork designed for the Join the Pack campaign, a partnership between Earthjustice and Creative Action Network. RO: How did you come up with the idea for your design? SL: The idea originated from noticing how similar the movements of howling and kissing are. On the surface they seem like polar opposites, but are both just very spirited expressions of passion! 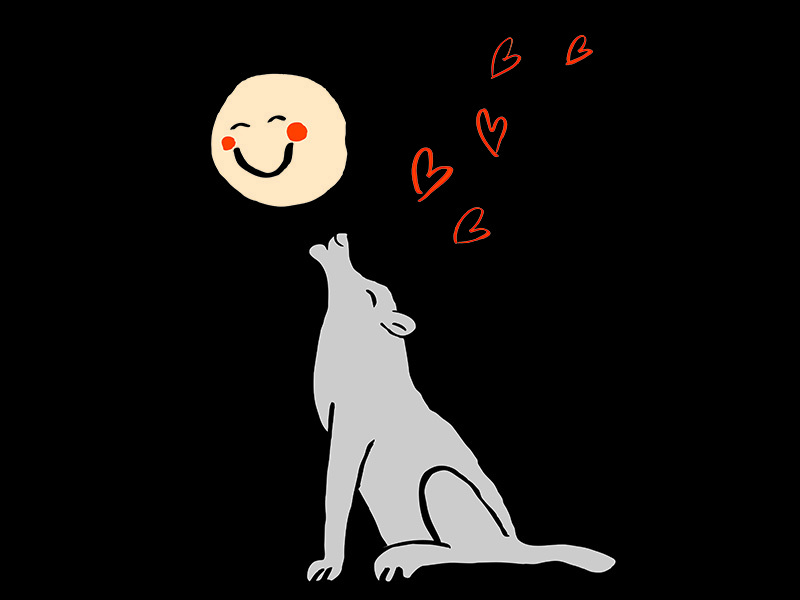 Wolves howl for many different reasons, including to attract females, and I really wanted to focus on that side of their nature since the "My, what sharp teeth you have" aspect has been well-established. RO: Wolves are in the crosshairs now. What do you think needs to be done to protect them? SL: It comes down to having more respect for their presence. Wolves' numbers have decreased so dramatically over the years, largely because they are viewed merely as a nuisance and not as a valuable part of our habitat. It's easy to demonize these creatures when we really ought to be looking to them for inspiration on how, as predators ourselves, we can learn to function harmoniously within the world around us. I think it really involves a big shift in attitude more than anything, but keeping them protected by law would certainly help. RO: Do you think art can change the public’s perception of wolves? SL: Of course! A lot of people aren't aware that wolves are in danger, or really what wolves are all about. I think art can help to make wolves feel more relatable and like less of an enemy. Thanks to Susanne Lamb for sharing her thoughts with us. You can follow her on instagram @lambpocket. Want to take action to help protect wolves or submit artwork to the campaign? Learn more. Rebekah Olstad is based at Headquarters in San Francisco, CA.